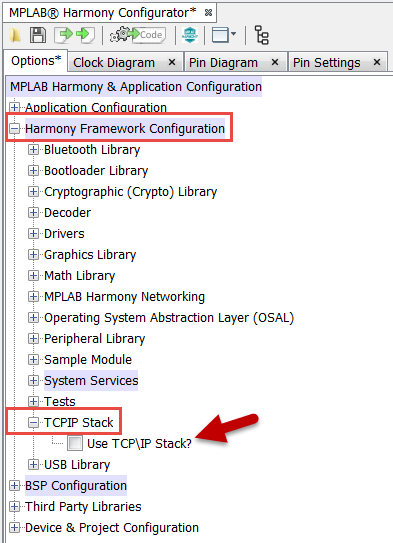 In MHC's Options tab, expand the Harmony Framework Configuration > TCPIP Stack selection tree. Check the "Use TCP\IP Stack?" box. 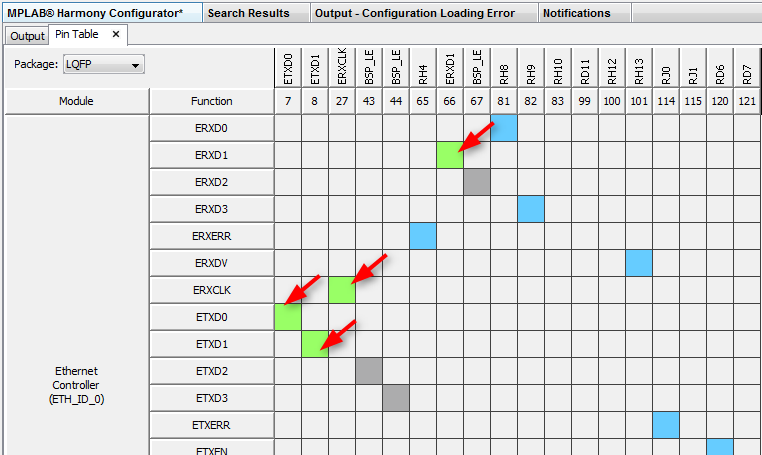 After you check this box, all TCP/IP stack configuration options become visible. Note the "Use TCP/IP Stack?" selection option is now highlighted, indicating this selection has been changed from its default value. However, if you choose to use a specific Board Support Package (BSP), the corresponding BSP .hconfig file will be used instead. Please search "hconfig" in the Harmony Help file for more information. You will note there are a lot of configuration options for the TCP/IP stack! Fortunately, the vast majority of these selections have been made for you. 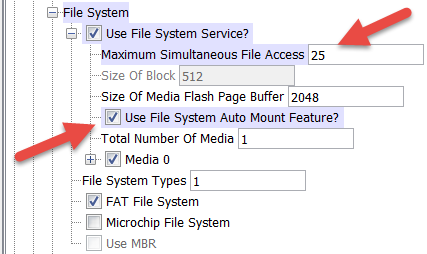 As this application will stream large files to the web client, you must increase the size of the transmit buffers. Configure the network interface to use the PIC32's internal MAC. 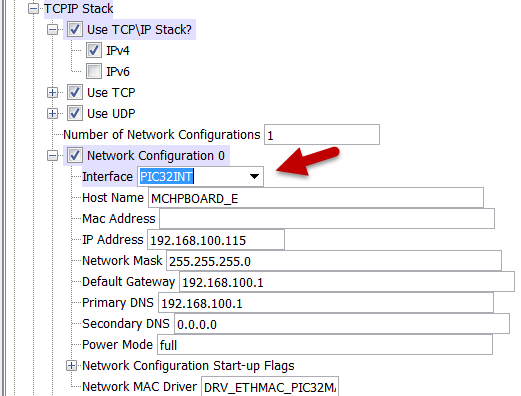 Expand the TCPIP Stack > Network Configuration 0 selection tree and use the drop-down menu to select the "Interface" as PIC32INT. 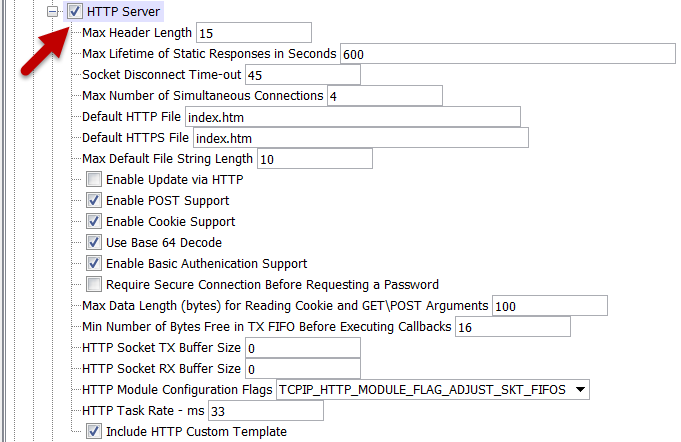 Add an HTTP server to the TCP/IP stack by simply checking the box beside TCPIP Stack > HTTP Server. Retain the default configurations as shown in the following image. Add "ping" capability (determine if an IP address is reachable) to the TCP/IP stack. The ICMP (Internet Control Message Protocol) is used for this. 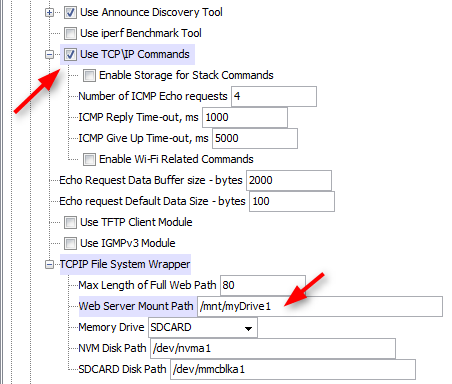 Check the box beside TCPIP Stack > ICMPv4 Client and Server, then check the boxes beside both the client and server options as shown in the following image. 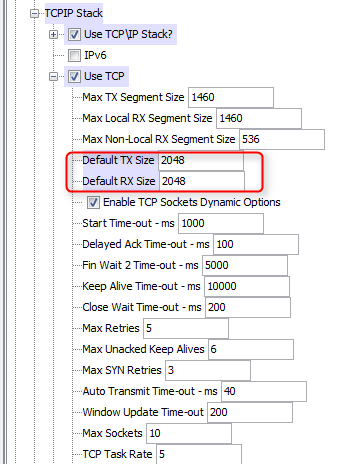 Check the box beside TCPIP Stack > Use TCP\IP Commands (see image below). Checking this box enables the TCP/IP stack to send and receive messages using the Console System Service (USB serial port with terminal emulator). This is how you will find the IP address assigned to the development board. Change the location where the HTTP server looks for its web pages. Expand the TCPIP Stack > TCPIP File System Wrapper selection tree and change the "Web Server Mount Path" to /mnt/myDrive1. Expand the following section to see descriptions of all TCP/IP configuration options. Future Harmony versions will be improved to completely configure the Crypto Library for you. If you are using a version newer than v2.01b, you may be able to skip this step. The Cryptographic library is required by the HTTP Server. When you enabled the HTTP server, MHC automatically enabled this library for you. In MHC's "Options" tab, expand the Harmony Framework Configuration > Cryptographic (Crypto) Library selection tree. Check the "Use Random Number Functions?" and "Use Cryptographic Library" boxes. 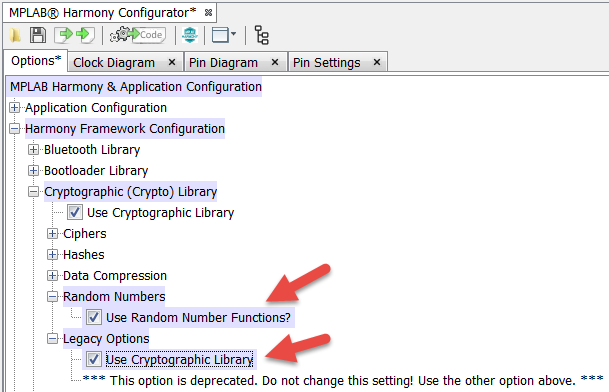 Expand the following section to see descriptions of all Crypto library configuration options. The File System service is required by the HTTP Server to store its web page on the SD Card. When you enabled the HTTP server, MHC automatically enabled this library for you. In MHC's Options tab, expand the Harmony Framework Configuration > System Services > File System selection tree. You will be using a FAT file system with Auto-mount feature on SD Card media. You should be able to simultaneously access multiple files. To be able to do this, you should configure the file system service as below. Refer to the screenshot below. You should have a similar screen on your setup. Future Harmony versions will be improved to completely enable and configure the Internal Ethernet MAC driver for you. If you are using a version newer than v2.01b, you may be able to skip this step. You configured the TCP/IP stack to use the internal PIC32 MAC for the network interface. You need to enable and configure the driver associated with this MAC. 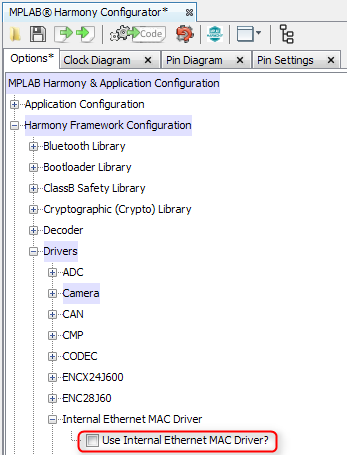 In MHC's Options tab, expand the Harmony Framework Configuration > Drivers > Internal Ethernet MAC Driver selection tree. Check the "Use Internal Ethernet MAC Driver?" box. Select the Pin Table tab in the MHC output pane. If this window is minimized, it can be found on the bottom left part of MPLAB X IDE. Click on it to maximize it. Configure the pins required for TCP/IP as shown in the below graphic.